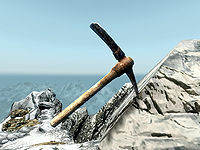 Strangely, the editor ID for this item is "dunVolunruudPickaxe", suggesting it originally had some connection to Volunruud. 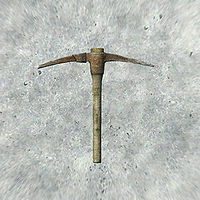 This pickaxe was named after the creator of Minecraft, "Notch". Despite being a unique item, the Notched Pickaxe can be disenchanted. The enchantment on the Notched Pickaxe restores damage to your Smithing skill rather than enhancing it. For unknown reasons, the pickaxe may be missing when you reach the peak of the Throat of the World.